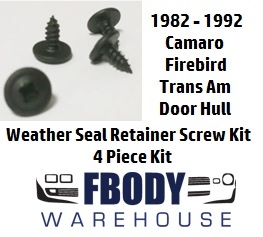 1982 -1992 Camaro Firebird Trans Am Door Hull End Cap Mounting Screws 4 pc Kit. These are the 4 screws which hold the door hull weatherseals at the end caps secrely into place. Correct OE style Phillips head and thread makes these the proper fit and function! One kit does both left and right door hull seals. 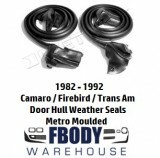 1982 1983 1984 1985 1986 1987 1988 1989 1990 1991 1992 Camaro Firebird Trans Am.